Product prices and availability are accurate as of 2019-04-15 15:47:34 EDT and are subject to change. Any price and availability information displayed on http://www.amazon.com/ at the time of purchase will apply to the purchase of this product. Introducing TASSIMO, a revolution in home brewing. This state of the art system delivers the ultimate in hot drink variety - coffee, tea, espresso, hot chocolate, and even authentic cappuccino & latte with real milk, all at the touch of a button. 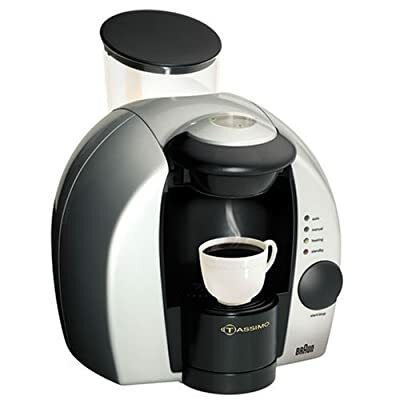 The TASSIMO hot beverage system brews one perfect cup at a time using TASSIMO discs, called T-DISCS, that contain precisely measured amounts of the ingredients for each drink. Each T-DISC contains a barcode that tells the machine the optimal brewing conditions for your drink, expertly adjusting the brewing time, amount of water and temperature. With TASSIMO, you simply insert a T-DISC, press the button, and in about a minute you can enjoy a delicious hot drink, one perfect cup at a time. You are also able to customize the strength of each beverage to your taste. And, since all the brewing takes place in the T-DISC itself, there is virtually no cleanup! A system this extraordinary deserves partners of the same caliber. Select from world-class brands Gevalia, Suchard and Twinings? to find your favorite drink. Discover the Art of the Perfect Cup. Right on your kitchen counter.